Theo Waitley has lived all her young life on Delgado, a Safe World that is home to one of the galaxy's premier institutions of higher learning. Both Theo's mother, Kamele, and Kamele's onagrata Jen Sar Kiladi, are professors at the university, and they all live comfortably together, just like they have for all of Theo's life, in Jen Sar's house at the outskirts of town.Suddenly, though, Theo's life changes. Kamele leaves Jen Sar and moves herself and Theo back into faculty housing, which is not what Theo is used to. An infinite, sweeping saga of interstellar war - the first SF classic for the 21st century. The empire of the Shaa lasted 10,000 years. Years of terror, infinite violence and oppressive, brutal order. Now the Shaa are no more, but the terror and violence are only beginning... The Shaa, rulers of the universe, began to commit ritual suicide when it became clear that their minds - profoundly intelligent but limited - would accept no further information. Near immortality was their one, great mistake. The centuries-long war between the Confederation and The Others, a group of violent alien species, is over. Intergalactic peace is finally restored. Torin Kerr and her crew of ex-marine friends have gone freelance using their military experience as guns for hire. But this calm equilibrium cannot last. Someone is searching for the lost weapons of the H'san: powerful tools capable of destroying entire planets. Though the H'san gave up fighting long ago, the reappearance of their weapons would no doubt lead to a devastating war. It is up to Torin Kerr and her team to fix this problem before it explodes. Centuries in the past, mankind fought a seemingly unbeatable adversary from sector to sector across the Spiral Arm until the war ground to a standstill and the Enemy withdrew. Believing that they had won, the citizens of the galaxy rebuilt. The Inner Worlds, which had escaped the worst of the war's ravages, became even more insular, while the Rim worlds adopted a free and easy way with law and order. Now, hundreds of years after their withdrawal, the Enemy is back - and this time they'll be satisfied with nothing less than the extinction of the galaxy. In the third novel of the Liaden Universe, Priscilla Delacroix is betrayed and abandoned by her shipmates. But confronting the crew will be far easier - and safer - than confronting the demons of her past. 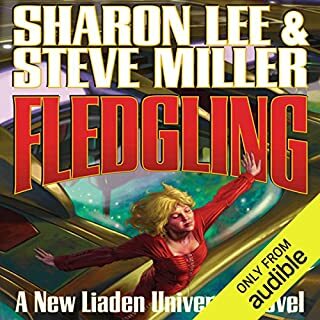 ©1988 Sharon Lee and Steve Miller (P)2012 Audible, Inc. I loved Priscilla's story and how she grew and overcame. Norbears <3 <3 <3 I've always wanted one! For those that love books that embrace female power, here is your star ship ride! Tree and Dragon!! 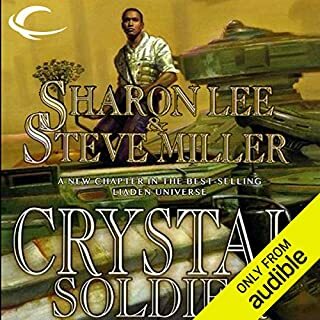 I did feel that the narrator missed the cadence of Shan's voice. Though thorough and precise in his enunciation, the sparkle and edge was missing in the deliverance, especially when there was dialogue between Shan and Priscilla. 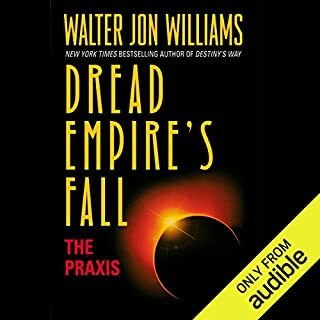 This was slight and really those of us that have loved these books for over several decades are going to be overly critical. I overall LOVED that I can have this story on my iPod and be able to listen to it over and over. Long live Korval! 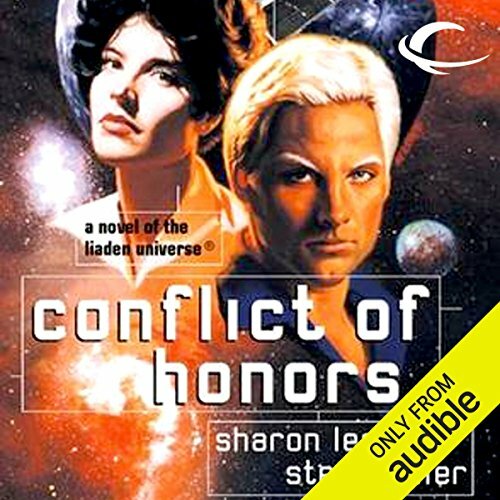 What made the experience of listening to Conflict of Honors the most enjoyable? That I could listen to something I've read so many times the book is falling apart. I like how this book ties in with all the rest so well, The different cultures in the worlds involved in the liaden series are not strangers to prejudice, cultural misunderstandings, religious zealots, vengence, and drug problems. Despite all that this is more of a romantic story, and not a negative one at all. What three words best describe Andy Caploe’s voice? "Or a lesson in not angering dragons." The entire series is well worth your time. Start with agent of change. What did you love best about Conflict of Honors? Story. I am a huge Liaden series fan. Shan. A great combination of strength, brain, wit and gentleness. What aspect of Andy Caploe’s performance would you have changed? Women sound (practically all of them) breathless, childish and simpering most of the time - which clashes with the characters as they are done in the books.Liadens (in the books) are famous for great manners and self control - but some male personages sound more like gangsters from an old noir B-movie (and not a very good one either - definitely not Bogart level). Good example - a distinguished Dea Gauss who sounds alternatively pompous, cheap and melodramatic. No, but I know all the books of the series anyway. Narration is adequate but often is overly melodramatic and lacks humor and quiet dignity (that are so obvious in the books). 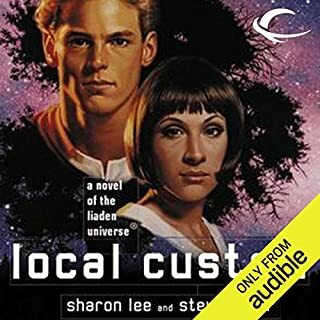 This is by far my favorite of the Liaden novels, and a good possible place to start if you are looking for an entry point into the universe. Space travel, energy weapons,, knife fighting, mental paranormal abilities, kids, handsome Captain, strong heroine, efficient men of business, and Romance! Who could ask for anything more? And written so long ago. 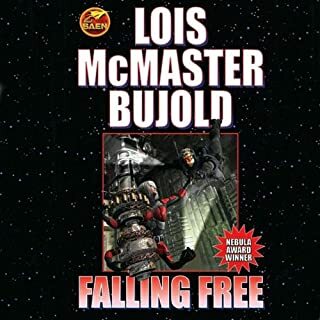 How did I miss these prolific authors in all the years I have been reading science fiction. Love it. Andy Caploe does a good job with pacing, voices, and the like. Just not the very best I've heard. . . yada yada boring. mellow dramatic. and a poor reading.